It’s no secret that Firefox users love to install add-ons — more than 1.5 million are downloaded every day from our official gallery. But users aren’t the only ones who love adding on to Firefox: third-party applications frequently install bundled add-ons into Firefox as part of their own installation process. 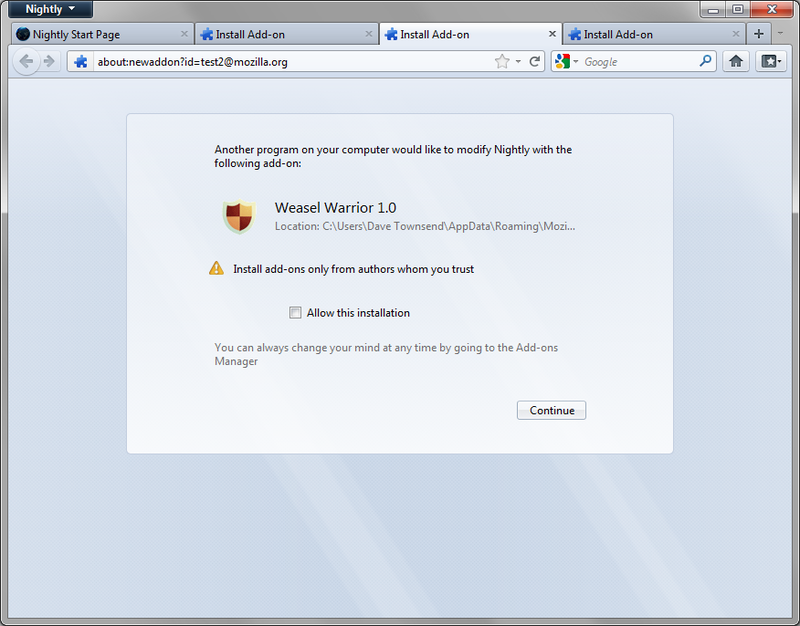 While some of these applications seek the user’s permission beforehand, others install add-ons into Firefox without checking to make sure the user actually wants them. 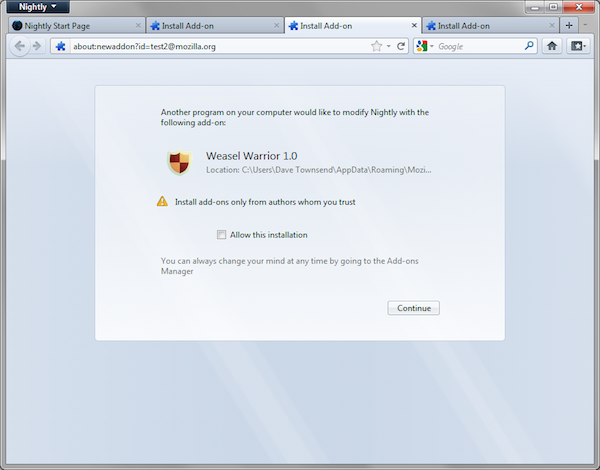 If Firefox starts and finds that another program has installed an add-on, Firefox will disable the add-on until the user has explicitly opted in to the addition. Users that want the functionality provided by a third-party-installed add-on can easily allow the installation, while users who don’t can cancel or ignore the prompt. Upon upgrading to this upcoming version of Firefox, users will be presented with a one-time dialog to select the add-ons they wish to keep installed. 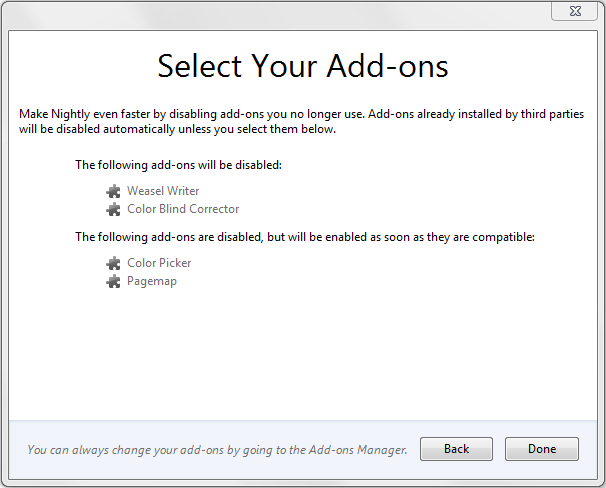 By default, all of the add-ons the user has installed from within Firefox will be kept, but add-ons installed by another application will be disabled unless the user chooses to keep them. Regardless of installation method, we encourage users to disable add-ons they aren’t using to improve Firefox’s performance. 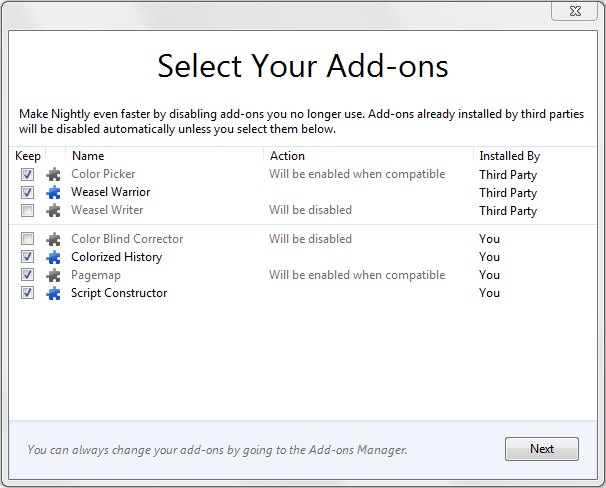 If any add-ons will be disabled, the user will be asked to confirm the changes. This additional step should ensure users don’t accidentally disable add-ons they wish to keep. We understand that there are legitimate use cases for some third-party add-on installations, and that those developers have done the right thing by asking users to opt in to the add-on, following our performance best practices, and providing a good user experience. Unfortunately, the extent of unwanted add-ons installed through these methods has caused us to take action, but we’re confident that users who truly want such add-ons to be installed will opt in when Firefox prompts them. You can try out these and other new features in Firefox Aurora starting next week. Chrome is the best and safe than all browser in the world. but i can’t found any option to enable it. it just displays not compatible with 14.0.1. Give some Solution. How to Enable it???? Please add IDM to your Mozilla builds. The present download software does not always download software correctly. I realize that DAP has been around a lot longer but their software isn’t always the proper venue for the result that is being expected. I am also having problems installing programs after they are downloaded. Using your allowed DAP software has continually prevented the installation of software I have downloaded. Hi, I’m not happy with Google Chrome, but I do not know why so many sites you define. To quote M. Good, but you can Google the rest ………. i have a problem on my computer. my idm was not working.